We are very pleased to present to you this exclusive document...The 1953 Le Mans Duntov Memo. To our knowledge it has never been seen in public. Back in January, we shared a map of the Le Mans course with Zora Akus Duntov's notes on the speed zones around the track and that it was a part of a larger report that helped set the performance transformation of the Corvette. You may also recall that Zora was almost fired by GM for racing at Le Mans for the Allard team...saved only by the grace of Ed Cole. 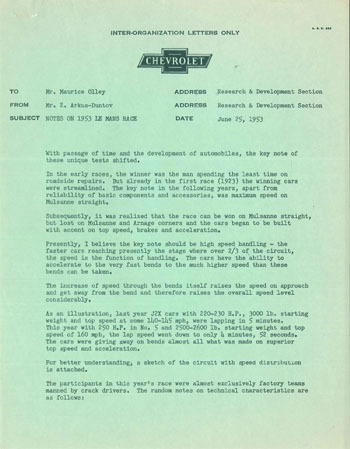 The report is fascinating in that he provides an analysis of the competition, along with a scathing review of the Allard JR's handling...while remaining steadfast that the Allard team had the best engines in the field (which happened to be Cadillac V8's...was Zora kissing up to the GM brass?). Click here or the image below to view the complete memo. Special thanks to Allard owner Steve Schuler and his mole within GM for sharing this important memo.